Wait. Foam parties are a thing? Outside of Ibiza in 1998? Well, they've apparently spread to Florida where the funky chemical bubble mixture has caused pink eye, abrasions of the cornea, and even worse. Yet again, my crippling nerd status has prevented me from attending something that would give me a disease. Dork high five! 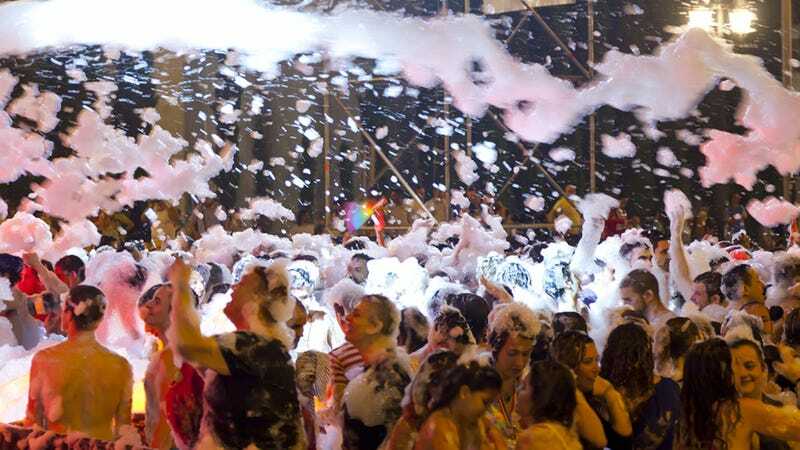 Foam parties, where strangers grind on other strangers while being sprayed down by giant hoses containing poisonous bubbles, have apparently been causing the CDC some heartache. After a foam party in May of 2012, Florida's Collier County Health Department was notified by law enforcement and hospital personnel that approximately 40 persons had sought care at local emergency departments because of "severe eye irritation and pain". In all cases, injured persons reported getting foam in their face, with 96% (n = 44) of interviewed persons reporting eye exposure. Almost 90% of interviewed persons reported rubbing their eyes after exposure to the foam. Eye irritation (94.6%), severe eye pain (91.1%), pink eye/redness (87.5%), decreased visual acuity (81.3%), and conjunctivitis (76.8%) were the most common injuries (Table). Of note, half of the cases were diagnosed with abrasions of the cornea (n = 28). For those persons who sought medical care, the average number of visits was 3.2. In 11 cases, patient's visual acuity could not be tested in at least one eye during their initial medical-care visit because they were unable to open their eye or read the first letter of the chart. Among persons interviewed, the average duration of symptoms was 7 days (median: 6 days), ranging from less than 1 hour to more than 1 month. In seven cases, symptoms had not completely resolved at the time of the interview (i.e., more than 1 month after the injury). Don't worry foam party enthusiasts, this appears to be contained to a specific Naples, Florida nightclub foam party, so you can probably still dive into the foam/sweat/other bodily fluids mixture at your local hot spot — just make sure to put on a full body condom first!